Whether you are looking for some ice-breaking pre-dinner games, daytime breakout time, post presentation fun, or a centre piece for a competition, choosing entertainment for conferences and conference dinners can be tricky as you'll invariably have guests of all ages and while some may be extrovert and outgoing some will be less so. Your event maybe formal so guests may be dressed for more sedate games, or if people are dressed more casually they may up for more active entertainments. 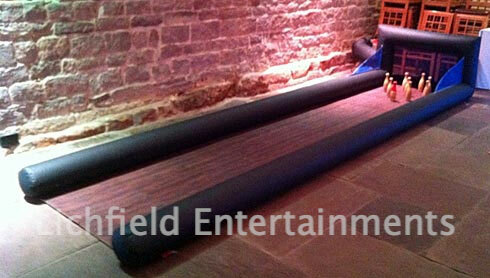 Whatever the event type with a range of over 100 items we have an activity that will be suitable. For prize competitions the items like the Grab a Grand and Reaction Speed games are always popular. To get people mixing before a dinner then maybe look at table games such as Table Football, Air Hockey, and Table Tennis and add in some Giant Games, Mini Golf, or Footpool. For more energetic games there are rodeo rides - choose from rodeo bull, sheep, football, or rugby ball - board simulators, various bungee run type games, and the brilliant Up the Creek four player electronic boat racing game. 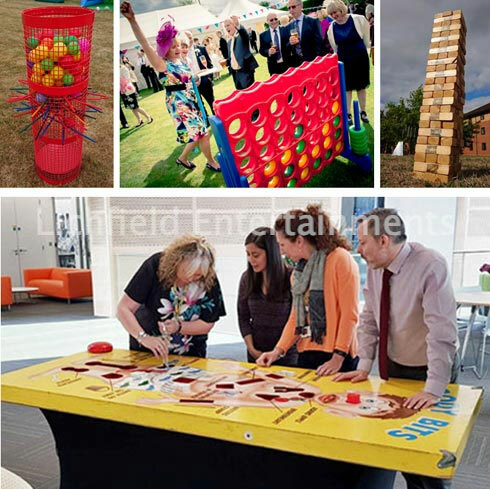 Based in the heart of the UK we supply our games and entertainments to conferences and corporate events throughout both the East Midlands and West Midlands and are happy to travel further afield upon request. We have a great range of Giant Games for your conference entertainment including Giant Jenga that starts at 4ft tall, Giant Four-in-a-Row, Giant Body Bits - over 6ft long, Giant Ball-Fall, Giant Inflatable Darts, and Giant Buzzwires ranging from table top versions to a floor based 10ft long Beat the Beep. Choose from four different Reaction Speed Games including the brilliant Batak, 360 degree Light Chaser, The Vault, or Whack-a-Mole type Strike a Light that can be played by either one or two players. We also have Ball-Nado and Grab a Grand, Race Simulators, our unique Up the Creek electronic boat racing, Giant Buzzwires, Double Hoops Basketball Challenge, Roll a Ball Horse Racing, Greenscreen Photo Booths, Magic Selfie Mirrors, and Selfie Pods. 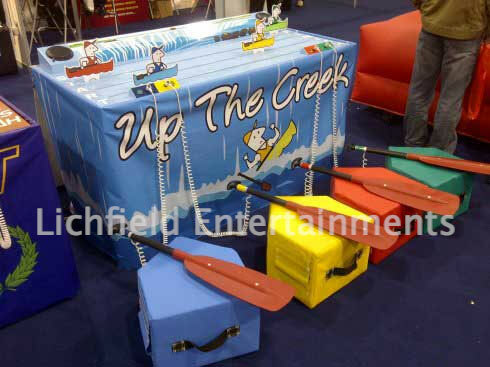 We have a range of inflatable games to provide amusement at your conference including Human Whack-a-Mole, Air Juggler, Skittle Alley, Blow-Football Table, and more. 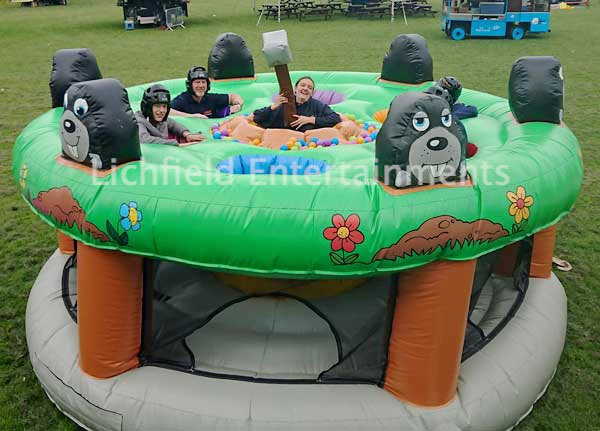 For a hire prices please email enquiries@lichfieldentertainments.com with details of the date and venue and we'll send you a full pricelist to take a look at. 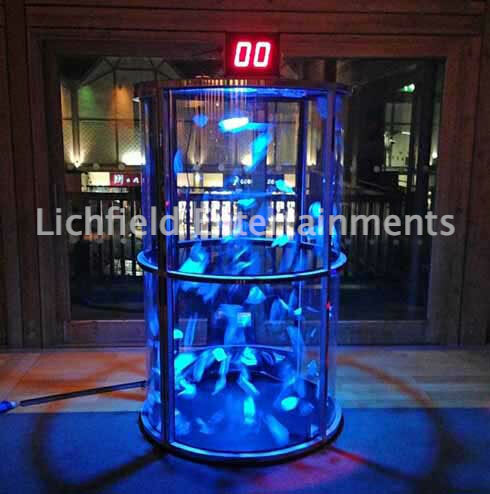 To discuss the entertainments we can supply for your conference or corporate evening please get in touch via enquiries@lichfieldentertainments.com or call on 01283 792974.